Welcome to the home page of the Bagpiper Restaurant located at Scotland High School. Within this web site you will find information on up coming events, pictures, and the menus for the restaurant. The purpose of the Bagpiper Restaurant is to provide hands on training in the restaurant and hospitality industry to the students of Scotland High School through the operation of our in-house restaurant called the Bagpiper Restaurant which is open to the public and staff on the Scotland high school campus. During the time that students spend in the Culinary Arts program students are introduced to the basic concepts of cooking ranging from basic knife skills, cooking methods, baking, safe food handling, Dining room service, and supervision skills. These skills are all practiced by the students through the operation of The Bagpiper Restaurant. 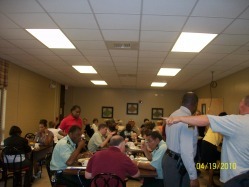 The Bagpiper Restaurant also offers other services such as in-house and off campus catering along with other services. Check out our catering page for more information.